Fiskars 360070-1001 Pointed / Angled Blade Hookaroon with Sheath, 28"
※ STAINLESS STEEL BEARDED HATCHET AXE WITH ADZE BLADE -POLISHED TWO BLADES TOOL! Head Weight: 1-1/2 lb. Overall Length: 36"
Product is well made. 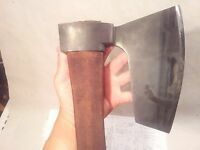 It is a one piece forging with a nice wooden handle. The only problem I had was the tip is to blunt. I took a file and made a nice sharp point. Works great, even in oak. I work with big wood. I had to role the wood to the splitter. After buying this Hookeroon, I didn't have to strain my back to role the cut pieces to the splitter. I'm talking pieces from 12" to 30". I should have bought this Hookeroon years ago. Saved me a lot of time. Great product. This should save a lot of obcenities! I bought this to use with my wood splitter for when a chunk gets away then I can hook it with this tool and hopefully avoid some steps. Tip needs a little sharping other than that it's a great product.